Do you have a business luncheon, a staff meeting, or a birthday party? Whatever the event, if you wish to serve your guests great food, just give us a call and we’ll make sure they’re satisfied. 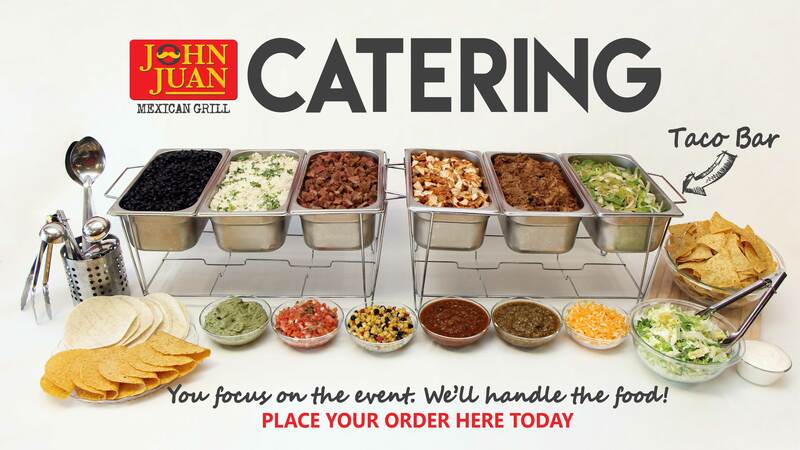 Our premium catering fillings are prepared from scratch in our own kitchen! We use only fresh and never previously frozen meats. Hand-rolled Burritos customized by you or let us create an assortment; choice of Small-size or Regular-size Burritos (vegetarian, chicken, beef, pork, or steak). Add homemade guacamole for $1.75. Taco Salads customized by you or or let us create an assortment; choice of fillings (vegetarian, chicken, beef, pork, or steak). Comes with homemade guacamole. Quesadillas customized by you or selected by us; choice of fillings (chicken, beef, pork, vegetarian, or steak). Comes with sides of medium or hot salsa, and sour cream. Add homemade guacamole for $1.75. Menu prices subject to change without notice. Always see store for details. Copyright © 2018 by John Juan.